A super-charged Capricorn lunar cycle begins this week. Significant coincidences abound giving those of us who follow the Moon good opportunity to lay down solid new patterns of transformation. The New Moon occurs less than two hours after the Sun enters Capricorn, signaling the beginning of winter in the Northern Hemisphere and a new lunar cycle of mindful manifestation. Saturn, the planetary ruler of Capricorn, is moving into a new sign just a couple of days after the New Moon. (Saturn stays in a sign about two and a half years, so this is a big deal.) Pluto, which has been in Capricorn since 2008, has recently made an exact square to Uranus in Aries agitating turgid, old-guard mentalities, a shadow side to Capricorn. Change is in the air; systems are under review. This Capricorn season is a chance to advocate for changing systems that no longer function well for us. Capricorn qualities. In the Northern Hemisphere, Capricorn’s season begins with the longest night. Winter has us instinctually guarding the storehouses to make sure provisions will last until the next growing cycle begins. This survival instinct gives Capricorn an intense need to maintain systems of behavior and codes of law. Agreements and integrity make the systems work. The Capricorn Goat is a mountain climber. Now, we begin the climb out of seasonal darkness and have a long way to go before the hours of sunlight exceed the night’s. Steadiness, dependability, and an ability to defer gratification are admirable Capricorn qualities that help us complete this journey. The Tarot card that stands for Capricorn is The Devil. Capricorn’s high expectations can enchain us yet also liberate us if they lead to wisdom and mastery. Capricorn’s natural realm relates to aspirations, career, and success. Capricorn rules the bones and the knees. History, legacy, and tradition influence Capricorn’s choices. As a cardinal earth sign, Capricorn means business and appreciates the literal facts of things. Yet, there is a paradoxical, mystical side to this sign. Capricorn’s Mountain Goat has a fish’s tail, signifying how Capricorn can be both grounded and fluid when necessary. This side of Capricorn swims in the vast waters of ultimate truths seeking wisdom about the structures of self and society. From these foundations, Capricorn reaches for the absolute best there is. As the guardian of rules, traditions, and hierarchies, Capricorn represents the “system” under which we live. When Pluto entered Capricorn, we began to see more clearly the toxicity in our systems. With Uranus squaring Pluto (since 2012), more and more people are activated to change these systems. Capricorn assesses the bottom line by asking, “Does the system work for me? Do I have a chance of success under this system?” As we consider these questions it is important to know what success means to us. Is an economic system that concentrates wealth for only a small percentage of people either sustainable or successful? Is extracting and burning more and more fossil fuels at the cost of our environment a successful system? Is incarcerating millions of Black men in the name of a war on drugs a successful way to create a vibrant and healthy society? What is success? These Capricorn qualities will be important as this lunar cycle progresses. This month we’ll be motivated to work harder, define our bottom line, and reach for new goals. It may be impossible to climb the Capricorn mountain to success without first evaluating what success means to us. We live in liberating times. As we re-imagine our systems, we gain the strength of Capricorn’s determination. My intention for this Capricorn lunar cycle is to redefine my vision of success to create a system that sustains beauty, liberation, and truth. The Mary Oliver poem, The Summer Day, asks a great Capricorn question: “Tell me, what is it you plan to do with your one wild and precious life?” What mountain is worth your effort and your dream? December 21—New Moon: Dreaming. Winter Solstice (Northern Hemisphere). The introduction to this week’s forecast (above) sets the tone for this super-charged Capricorn lunar cycle and Winter Solstice day. We begin to climb out of the darkest time of the year in the northern hemisphere just as the Capricorn Mountain Goat is poised to begin a new climb to excellence. We live in revolutionary times. Systems are under review. When we know that the system supports our goals, we can enjoy the work that Capricorn invokes. What is the seed you plant in the darkness? It is important to take this winter season to evaluate what you want to grow from this potent time of the year and what systems you will commit to. The Sun and Moon in the New Moon chart are at the first degree of Capricorn, the cardinal earth sign. The beginnings of cardinal signs are considered very powerful points of initiation. If a New Moon is an opportunity to lay down a new pattern in our lives, then this New Moon is a potent opportunity for intention and change. Earth-centric energy is enhanced. This applies to our bodies, the body of the Earth, and to solid forms and manifestation of desire. The metaphor of return from darkness in the northern part of the world and from the apex of summer in the southern part of the world helps us as we encounter challenges and doubts along the way. Light and dark are powerful qualities to harness in our lives at this moment. Uranus stations direct today while squaring Pluto. Characteristically, winter calls us to spend more time in reflection, but the fires of action still burn brightly. Planets are stronger when they change direction. Uranus creates an atmosphere of impatience with old systems that simply are no longer functioning. We can expect that this urgency does not die down for a while. The final square between Pluto and Uranus is in March 2015. Both of these planets are moving direct and will remain closely square (within one degree) until that time. Not since these two planets began these transits in 2012 has this been the case. It looks like this paradigm changing transit will go out with a bang. Monday, December 22. This is an excellent day to evaluate the systems that either support your goals or inhibit them. The Moon in Capricorn is busy today. As most of us sleep (CST) the Moon makes an enchanting sextile to Neptune. Do you remember your dreams? At this seed time of the year, dreams have significance. Later the Moon conjoins Mercury in Capricorn and we benefit from strategic thoughts and conversations. What is the plan? Capricorn likes to think long-range, spanning the ancient past into the realizable future. With increased attention we begin to notice the Uranus/Pluto square being activated by the Moon. As long as we are willing to change the systems, we are energized to work for our goals. Those who are entrenched in the status quo may have a harder time. All of us will need to make adjustments in order to get with the program. Tonight may be good for meaningful connections with others when the Moon conjoins Venus. Tuesday, December 23. Saturn enters Sagittarius today. Those born under this Sun sign could very well feel Saturn breathing down their necks. Sometime in the next two and a half years, Saturn will transit your Sun, asking you to get real about what your life is about. For Sagittarius, this can be uncomfortable. Sag likes to have lots of options and tends to have an escape route planned. If this dynamic describes you, does this pattern support your long-range plans to manifest your life purpose? Saturn wants us to ask ourselves these questions. The push and pull is between responsibility and daring to take off on new adventures. It isn’t about one or the other being better. Saturn’s secret desire is for each of us to attain mastery and wisdom. In this season of Capricorn, we notice a shift in how Saturn is speaking to us. There is a middle path. When the Moon enters Aquarius tonight (CST) it forms an encouraging aspect to Saturn. Tonight is a good time to dream about your life and your work. Wednesday, December 24. Visionary energy is high today. The Moon in Aquarius has us analyzing systems for their ability to liberate us. We either want to tinker with systems or just overthrow them all together. Mercury in Capricorn conjoins Pluto and squares Uranus in Aries today and tomorrow. Mercury’s mental talents are focused through the Capricorn lens toward recognizing the change that needs to happen and the ways we will work to achieve our visions. Responsibility, integrity, and clear-eyed pragmatism are assets. Notice who has these qualities and cultivate those relationships. Just to make sure we stay awake during all this, the Moon conjoins Mars tonight (CST). If you celebrate Christmas, this may not be one of the most tranquil Christmas Eves, but it could feel important and inspiring. December 25—Crescent Moon: Beginning. At this stage of the lunar cycle, we notice that both conscious and unconscious choices have created increasing momentum. The train has left the station. Considering how much large planetary energy was activated in the first few days of this Capricorn lunar cycle, this may be even truer this time. The train has indeed left the station and we have a better sense of the work ahead. What seeds are you planting in the dark? My New Moon intention was to focus on what success meant to me and to evaluate the systems that I live within. Have you noticed the connection between success and systems? Is there alignment for you? The Moon is in Aquarius most of the day so peaceful Pisces energy might not be felt until late this evening (CST). Political conversations at holiday gatherings could be encouraging or conflict-filled. The Moon opposes Jupiter making these interactions more volatile unless we remember to acknowledge individual expression and choice. Many are in the process of changing opinions and not everyone feels graceful or secure during the transition. The sextile between Mercury and Chiron nudges us towards compassion and empathy. This could help us to think twice before blurting out harsh opinions. Friday, December 26. Time to rest, reflect, and replenish. The Moon in Pisces may leave us feeling more sensitive and vulnerable. A lot of recent emotion needs to be processed and released. Rather than head back to the malls to escape lingering tension, find a gentle way to support your soul. 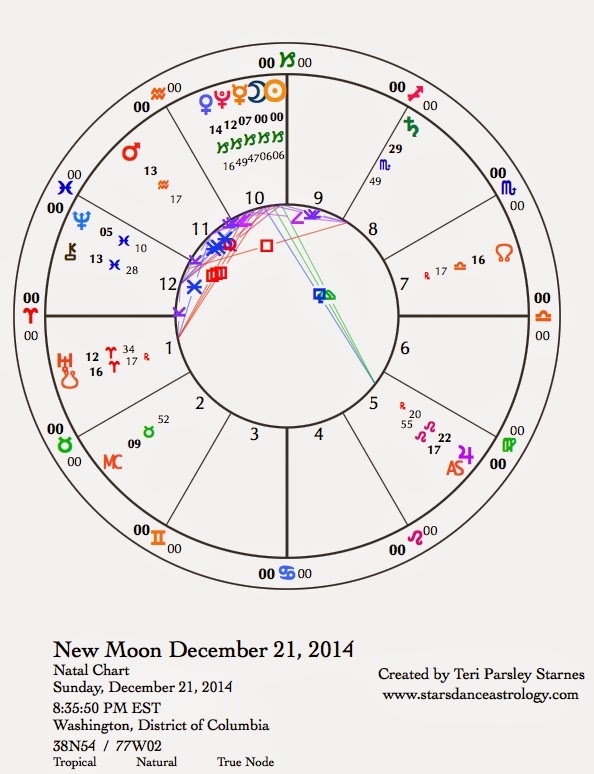 The Moon conjoins Neptune this morning (CST) doubling the effect of the Moon in Pisces. We really do need to listen to our hearts. The Sun joins in with an encouraging sextile to Neptune today too. Capricorn can sometimes feel like it is all about business. This contact with Neptune reminds us that we are more than our accomplishments and goals. There is good support for integration today. Saturday, December 27. Pisces integration continues. Within your tender heart, notice a longing for significance and impact. The quincunx aspect between Venus in Capricorn and Jupiter in Leo shows us the ways we are pulled between believing we must work hard to be appreciated and how we deserve appreciation just for being ourselves. It isn’t an either/or situation. Sometimes hard work does get us the accolades we desire and sometimes the best acknowledgement we could receive is that we matter to someone else.